Saulden is a victim of the Undead Curse who traveled to Drangleic in the usual way, for the usual reasons, only to realize that the cure he sought was not so easily obtained. Saulden lost the will to continue his quest and settled down in Majula, where he spends his days wallowing in misery. He still has good advice on offer, however, and heads the Drangleic chapter of the Way of Blue, a Covenant which provides protection and guidance to Undead travelers newly arrived in the kingdom. While the bleak and desolate landscape of Majula only serves to deepen Saulden's sadness, livening up the town by bringing some new residents will raise his spirits considerably. When aggroed Saulden will attack the Player with what looks like a claymore. He also has a Silver Eagle Kite Shield. 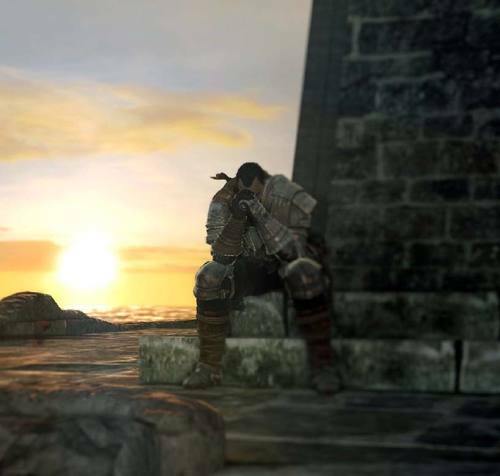 A somewhat memorable figure to those who have been engaged in the series since Demon's Souls, Saulden is yet another Crestfallen Warrior, a symbol of the Dark Souls player who has given up hope and has resigned himself to despairing what hardships await. Despite the pessimism though, this time around our Crestfallen fellow offers what might also be an aspect of the player who feels hopeless in the face of Dark Souls' ferocity as a game: Jolly Cooperation! It is a kind of settlement; a place where life is, almost, normal. And in Drangleic these days, there are very few places like that." "I am Saulden… and like you I lost everything… and now I'm here. You probably heard that it was possible to break the curse here. there's nothing here, for you, me, or anybody." "Do you know much about Souls? I'm told that the soul is the essence of life itself. Anything living, sentient or no, supposedly has one. To be alive… to walk this earth… that's the real curse, right there. And that's quite a predicament, really…"
and wherever you go from here, you'll sooner or later come up against them. Each has a powerful soul… And a terrible curse. If that frightens you, then you ought to just give up right now… like I have… hah hah hah hah." "Do you ever cry out for help? You'll face invaders from other worlds at every turn. If you need help, why not proclaim faith in the Blue Sentinels? Protection is yours, if you wish… you need only accept their kind embrace." Yes: "That is a wise decision. People are weak… But the Blue Sentinels watch over us in their benevolence. Let the Sentinels cradle you in their embrace." No: "I see. Then you'll have to brave this treacherous journey on your own. If you ever require help… come back, any time. I will stay here, and pray for your safety." 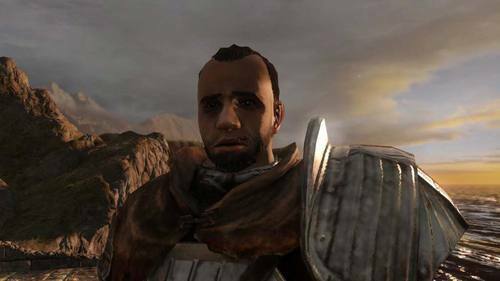 "Do you feel… lonely, here? It suits me just fine… as I've nothing left, anyway. It will grow on you, this place… give it some time." "Do you see the way beyond the bonfire? That will take you to the Forest of the Giants. You may just find something there that will be of use on your journey. But don't venture too far inside… or you might not come back." But the road leading there is perilous. But how it works… I just don't know." "Have you seen that pit, that gaping hole in the earth? I don't know what it's like down below… but I wouldn't suggest trying to find out. Besides, you'll never make it down there… not without a ladder of some sort." They exist all across the land… beacons to we, Undead. I wonder where the Fire Keepers went…"
"Did you notice any letters on the ground on the way here? Poignant wishes, dashed dreams. The messages convey our very inner thoughts. If your will to solider on falters, try leaving a message… Somebody out there is sure to listen." "You may notice symbols that appear upon the ground. If you fear Hollows, find summon signatures to call upon spirits to help you." "You… need my help, do you?" "I will always be here… watching over you." "Life is a journey… And every journey eventually leads to home…"
How they fret over all and sundry… Oh, those were better days. Oh, dear me. It really takes me back." Quite a hive of activity we are, these days. I'd forgotten how much comfort a little companionship can bring. I am grateful. For what you have taught me. It is very little, but please, take this. May they help you on your travels." "What could possibly come of this?!" "Finally, I will have peace…"
"Those who come to Drangleic seeking salvation soon lose hope, and turn Hollow. It happens to them all, sooner or later. That blue knight at the base of the tower… His spirit is already broken. Although he does offer sound advice. Perhaps he is a foreshadowing of your own future?"